Blazon: Impaled Arms: Dexter: the Sea of Fall River: Argent; a bend wavy azure behind a cross gules; at fess on a roundel of the third a star of six points of the first. Sinister: personal arms: party per fess azure and or; in chief, a circle argent within a triangle of the second; in base, a bend indented vert behind a roundel of the first bearing a bendlet of the third. Explanation: The art of heraldry developed in the Middle Ages as a means of identification in battle. In close fighting an easily recognizable shield was essential for telling friend from foe. As time went on, designs got more complicated and the use of heraldic designs moved beyond the battlefield so rules were developed and a group of experts called heralds came into existence to organize the system. The church adopted heraldry as a means of approving and authenticating documents as well as indicating ownership pf church buildings. Bishops used their Arms to decorate their episcopal thrones, vestments, coaches and tableware. To this day, the bishop’s Arms are used in official correspondence and the sealing important documents. In designing Arms, the bishop would either use his family Arms undifferenced (as did the Medici and Barbarini Popes) or adapt (difference) the family Arms by changing a color or by adding, removing or changing a symbol. If the bishop did not possess a family Coat of Arms, one would be designed that referred to his personal history or things that are important to him. As a diocesan bishop, Bishop da Cunha impales (joins) his personal coat of arms to those of the Diocese of Fall River which occupies the right (heraldic dexter) side of the shield (the left side as seen by the viewer – directions in heraldry are made from the perspective of the shield carrier, from the back). This impaling of arms signifies the close union between the diocese and its chief shepherd. The Fall River arms are silver with a blue wavy line going from right top to left bottom, which represents water and is an allusion to name of the diocese. The arms are dominated by a red cross which symbolizes redemption. In the center of the cross which is placed over the wavy line is a six pointed star, a symbol of the Blessed Virgin Mary who is called the “Morning Star” in the litany of Loreto and in honor of whose Assumption of Cathedral Church is dedicated. Taken all together, the arms represent the graces which flow from the Church into the lives of the people of the Diocese. 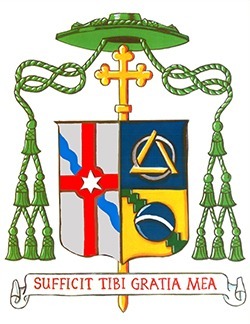 Bishop da Cunha has adapted his original coat of arms to simplify its presentation and to indicate that he now begins a new chapter in his life. The personal side of his shield (viewer’s right) represents where he comes from and the influences which have shaped his life and ministry. The bottom part of the shield represents the bishop’s life in Brazil where he was born and where he received first formation in the faith from his family and through the sacraments of the Church. The symbols recall the flag of Brazil. The colors of the flag are green and yellow (heraldic gold) and in the center there is a globe with a banner bearing the words “Ordem e Progresso” (Order and Progress). The words are not repeated in the arms but the representation alludes to them. The green of the flag is referenced by the indented green line which also refers to the motto of the Bishop’s home state of us that growth in the Christian life is sometimes accomplished through enduring difficulties. The top part of the shield represents the Society of Divine Vocations, the religious order to which Bishop da Cunha belongs, which was founded in Italy in 1920 by Blessed Justin Russolilio and began working in Bahia in 1950. The circle represents the world and the triangle represents the trinity; they are interlaced which indicates the Vocationist mission to bring the world to God and God to the world. The colors chosen are silver and gold which were chosen to represent the precious nature of the Christian vocation. The symbol is placed on a blue field which is the color of the Blessed Virgin Mary, a reminder that Bishop da Cunha’s vocation began with his baptism in Immaculate Conception Church in Gavião, Bahia, that he studied for the priesthood in Immaculate Conception Seminary, and that he spent his years of ministry as priest and bishop in the Archdiocese of Newark which is under the patronage of Immaculate Conception before being named to Fall River. Finally, the shield is complemented by the episcopal hat and cross and the scroll bearing motto. In ecclesiastical heraldry, the warlike helmet is replaced by a clerical hat called a gallero. Once the ordinary headgear of clerics, the color and number of tassels indicate the rank of the wearer. The color for bishops is green and has six tassels on each side. The cross behind the shield is a processional cross usually carried before the bishop in church worship services. The motto scroll is used to display either a scriptural quotation or an aphorism which the bishop takes as a model for his ministry. Bishop da Cunha has chosen as his motto “Suffict tibi gratia mea” [My grace is enough for you], which is taken from St. Paul’s Second Letter to the Corinthians (12:9), where Paul tells his readers that the Lord told him this when he was encountering difficulties. These words remind Bishop da Cunha that God’s grace will see him through the challenges that all Christians face in the modern world, especially as he begins his ministry as the chief shepherd of the Church of Fall River.